Passengers are welcome to board our ship at 6:00 p.m. After comfortably settling into your cabins, we'll introduce our crew at a welcome cocktail. Join us on an excursion for both packages: Visit of old Strasbourg in a riverboat (depending on availability). Our ship will sail through the night. Sailing to the towns of Lauterbourg, Spire, Mainz. 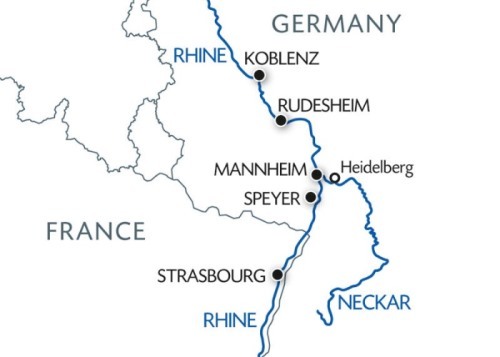 The cruise will continue towards Koblenz up the most beautiful section of the romantic Rhine. We will sail past the towns of Kaub, Oberwesel, Saint-Goar. Before we reach our mooring in Koblenz, you will see Stolzenfels castle. Arrival in Koblenz late in the afternoon. Explore the old city in the company of our hostess. The evening is free to do as you please. CLASSIC: Departure in a touristic train stopping at a wine tasting cellar*, followed by a visit to the museum of mechanical music. DISCOVERY: Hiking through the vineyards in Rudesheim. In the evening, the famous Drosselgasse awaits you with its numerous cafés and bands. Departure of the ship early in the morning to cruise up the Rhine to Speyer. We will pass the towns of Wiesbaden, Nierstein, Worms and Mannheim. Join us on an excursion for both packages: Heidelberg. Stopover in Speyer or Mannheim depending on berths available at the wharf. Back on board late in the afternoon. Tonight is our gala evening and dinner. Our ship will sail towards Strasbourg through the night. Discover the Rhine Valley and the legend of the famous Lorelei rock! It is said that a beautiful maiden threw herself into the Rhine in despair over a faithless lover and was transformed into a siren who lured fishermen to destruction. Embark on a surprising cruise through sublime landscapes that will take you to Koblenz and Rüdesheim, known for its vineyards and traditional cafes.